The only thing we love more than Halloween is Hell-oween! That's our special Deadlands< version of every gamer's favourite holiday. So we're celebrating with a rowdy mix of ghoulish goodies that's sure to make your hair stand on end! Every good holiday starts with a feast, but can you "Guess Who's Coming to Donner?" Maybe the most famous tale cowboy cannibalism in the West gets a tasty treatment by John "Night Train" Goff! And even better, it fits in both the Weird West and Hell on Earth! In a Fist Full o'Stuff, we go for the throat with several new and unique fiends of the blood-sucking variety. Then we have some new voodoo hoodoo, and the coolest information about undertaking we could "dig up". You'll also find frightful fiction by the legendary John R. Hopler. In Devil's Night, Gabriel Roth and Sam head to the "Bloody Old Muddy" to find out if the runours of masses of undead are true. What they find there is truly bone-chilling - and a major clue in what's coming in the massive story being told in Hell on Earth. 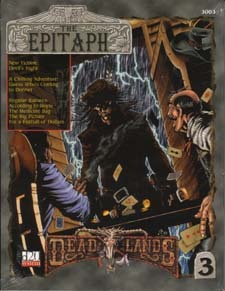 And just to make sure we've covered all our bases, this issue features our first ever exclusive adventure for Deadlands d20! Written by Dr. Rob Lusk, Rats in the Maze is a fast-paced romp through the flooded labyrinth that was California!